Several years ago, after a meeting of the midwest chapter of MWA, I was standing at the coatrack and heard two women next to me, talking. Our speaker had been a man in the insurance business who had just had his first crime novel published. One of the women said, "If he has a book out, why is he still working at his job?" I pause to let the published writers out there chuckle grimly. A great many people, including readers, seem to think that if Stephen King is paid a couple of million dollars per book, midlist writers must receive about a hundred thousand. In fact, a fairly typical advance for a hardcover from a first-time author is about five to seven thousand and many are paid less. A paperback original maybe three thousand. Certainly many writers earn more, and we all hope to work our way up. But most writers have to keep their day job. Which brings me to a recent event. On Yahoo, there are mini-articles, taken from a variety of sources. You know the kind of thing. Ten best cities to live in. Ten worst-dressed at the Emmys. This one was "Ten ways to save money." And number four was "Buy used books. Don't pay new-book prices." Well, I was horrified and dismayed. If nobody bought new books, few people would bother to write them. Of course, if nobody bought a new Lexus, just used ones--sorry, pre-owned--they would no longer be manufactured. But that's not likely to happen. Not buying books is in a different category. I love libraries and support reading library books. Libraries increase literacy in a lot of ways, including making books available to children, who mostly don't have the money to buy books for themselves. And used bookstores or new/used bookstores are valuable assets in a community. But people who love to read, who can afford to buy new books at least sometimes, still may not know how writers are paid. I wonder whether we as authors are doing enough to let the readers know that it is buying the book that keeps the writer they like to read going on writing. Most of us give talks or readings for a variety of groups, and in my experience there are usually questions about the book business. I'm not suggesting that mournful remarks on how little we are paid is a good idea. But it's easy to make the assumption that readers just know that most writers are paid on the basis of how many books they sell .In fact a lot of readers have no clear idea of this. And they're interested, once you start to talk about it. What is a mid-list author? What exactly is an advance? If you forego an advance can you bargain for higher royalties? What do authors earn, really? Does your company send you on all-expense-paid--don't laugh-- tours? People are genuinely interested in this and sometimes are too shy to ask. Many of you know already Bruce DeSilva from his crime fiction reviews at the Associated Press and the New York Times ... but now he has published a novel of his own, and if I tell you that his debut, Rogue Island, is making waves in the mystery community, I am guilty of gross understatement. On the Raves page on Bruce's website, I find myself in esteemed company - Dennis Lehane, Harlan Coben, Michael Connelly, Alafair Burke, James W. Hall, Peter Blauner, Ken Bruen, Thomas H. Cook, Ace Atkins, Otto Penzler, Tim Dorsey (and the less-esteemed company of Marcus ... but what the hell, you can't have everything). Anyway. You should follow the links above and learn more about Bruce DeSilva and Rogue Island. You won't be sorry. The most memorable crime novels transport you to interesting places and let you hear, see, smell, and taste them. Raymond Chandler, Walter Mosley, James Ellroy, and Michael Connelly have shown you Los Angeles through the decades. Read James Lee Burke’s Dave Robicheaux novels and you have been to New Iberia, LA, even if you’ve never left your house. It is difficult to imagine Ken Bruen’s best novels set anywhere but in his native Galway. The writers who regularly grace this blog provide a guided tour through the great city of Chicago—a city I have come to love. Through the years, I’ve gotten to know it from Wrigley Field to Comiskey Park and from Pilsen to the Loop. My wife, the poet Patricia Smith, grew up a West Side girl. So when I wrote my first crime novel, Rogue Island, I decided to set the story in . . . Providence, Rhode Island. Please allow me to defend myself. This summer, Newsweek crowned New Jersey the most corrupt state in America. (Nice try, Illinois.) But the magazine declared that Rhode Island was the most corrupt per capita. There is nothing new in this. You can trace the smallest state’s culture of crime and political corruption all the way back to one of the first colonial governors dining with Captain Kidd. For more than a hundred years, pirates slipped from Narragansett Bay’s hidden coves to prey on merchant shipping. In the late 1700s and early 1800s, Rhode Island shipmasters dominated the American slave trade. During the French and Indian War and again during the Revolution, privateers skulked out of Providence and Newport to seize prizes with little regard for the flags they flew. After the Civil War, Boss Anthony kept his Republican machine in power by buying votes at the going rate of two bucks apiece. At the turn of the century, Rhode Island’s own Sen. Nelson Aldrich helped the robber barons plunder the country. In the 1950s and 1960s, a Providence mobster named Raymond L.S. Patriarca was the most powerful man in New England, deciding everything from who lived and died to what songs got played on the radio. And more recently, Providence Mayor Vincent A. “Buddy” Cianci Jr. did federal time for conspiring to operate a criminal enterprise, a.k.a. the city of Providence. One of the many quirks of Rhode Island history is that no one knows how the state got its name, although historians have come up with several half-baked theories. According to one of them, the name derives from the fact that the state resembles the Isle of Rhodes. The only problem with that one is: It doesn’t. However, Rhode Island and its capital also share a culture of decency and integrity that began with its gentle founder, Roger Williams. The competing strands of good and evil wind all the way thorough the state’s history, and the tension between them makes for great storytelling. But that’s not the only reason I set my tale in Providence. Most crime novels unfold in big, anonymous cities like New York, Los Angeles, Miami, and, of course, Chicago. There are also many fine mysteries set in rural areas. But Providence is something different. The city is large enough to have the usual array of urban problems, and it’s surprisingly cosmopolitan; yet it’s so small that it’s claustrophobic. In fact, the whole state is so tiny that you can almost throw a baseball across it. Nearly everybody you meet on the street knows your name, and it’s almost impossible to keep a secret. Mulligan is paid to root out corruption. But he was born in Providence. He is not just from but of this place. So while he digs to uncover the truth, he’s not above placing a bet with a mobbed-up bookie or paying a small bribe to get his decrepit Bronco through the annual state inspection. As Mulligan sees it, graft comes in two varieties, good and bad, just like cholesterol. The bad kind enriches greedy politicians and their rich friends at taxpayers’ expense. The good kind supplements the wages of underpaid state workers, putting braces on their kids’ teeth. Without the lubrication of good graft, Mulligan says, not much would get done in Rhode Island, and nothing at all would happen on time. I strove to make the city of Providence and the state of Rhode Island not just the setting but something more akin to characters in Rogue Island. According to one reviewer, my portrayal of the place is “jaundiced but affectionate”—and that puts it exactly right. I just finished the sequel, tentatively titled Cliff Walk, and it, too, is set in Rhode Island. But once the third book in the series is written, I’m going to co-write a crime novel with my wife. It’s going to be set in Chicago—on the West Side. I’ve been writing in my car a lot, lately. And I’ve been spending most of my time in my car, so I’ve been pretty productive. Of course, I haven’t been writing crime fiction. We’re a week from Election Day, and I’m on the campaign trail with the Republican nominee for governor in Illinois. Wherever he goes, I go. Friday it was the suburbs across the Mississippi from St. Louis, with Newt Gingrich, no less. Saturday it was the North Shore. Yesterday, the Salem Baptist Church on the Far South Side. I bring it up because in the fiction world we know writing to be a solitary, somewhat lonesome, experience. (OK, I’m also bringing it up because I’m so buried in this right now that I can’t think about anything else.) Anyway, I know that quiet realm of writing very well, but because I’m a journalist I’ve always had this other experience of writing, as a more dynamic, interactive experience with other writers and multiple editors all huddling—literally or virtually—to put a story together. On a deadline. Most complicated news reporting is collaborative in this way. But political reporting, on a campaign trail, in the final days before the polling places open, is a special breed. And the 2010 midterms are pretty much this converted cops reporter's maiden voyage. You stick your recorder in the candidate’s face. Ask uncomfortable questions. Ask more uncomfortable questions. Then play the tape back while sitting in the front seat of your car, scribble the important answers down and craft a “feed” into three or four paragraphs that make sense. Thumb it into a BlackBerry and then send it to a string of other reporters and editors who are all working together. Back at the ranch, an editor or writer puts it all together. A couple hours later, the story evolves, and we do it all over again. Oh, all-powerful Internet, how we worship you. You might say this is no way to write, but I have a feeling that this is sort of how television shows get written—replacing imagination and creativity for reporting, of course. (Also minus the drivng, fast-food, and ...Newt.) And there’s some pretty great television writing going on, especially in the world of crime drama. In other news, my own newspaper and its corporate management has been very much in the headlines lately. I’m not going to spout off about it, but if anybody has questions about the craziness in the Tribune Tower, I’ll do my best to answer in a way that’s both informative and not likely to get me taken to the woodshed at the office. Just kidding, my bosses are wonderful people who would never resort to corporal punishment. I just returned from Bouchercon 2010 the annual mystery convention. My first writers conference was Bouchercon when it was here in Chicago. I remember finding the web page online, seeing the list of authors--many that I admired and read voraciously, and scanning the panels page. That conference sticks in my memory, mostly because it was my first, the weather in Chicago was beautiful (I rode my bike down the lake to get there) and many friends that I made there have stayed friends. Some were other, aspiring writers at the time that are now published and working on their second or third novels, and others were readers that loved the same authors that I did. What is fun about these conferences now is the fact that they take me away from my computer and writer mode and back into fan mode. I learn about new authors, new stories, and get to be a fan again. For the first couple of days I'm thrilled to be out and about. What's tough about the conferences is the flip side: that I usually don't have time to write. By the last day I'm usually holed up in my room pounding out a few pages. Writing keeps me balanced, happy, and gives me a chance to go wherever my imagination takes me. I love it. Can't wait to do more of it, and am thankful to be able to do it as a living. For that last bit I thank the readers. And our own Jamie Freveletti and Bryan Gruley continue to rack up the awards. Jamie won the Barry Award for Best Thriller, while Bryan won the Macavity and the Anthony for Best First Novel! The lease is up. The tenant won’t leave. Eviction is an option (two years ago!). What’s the deal? Maybe the neighbors don’t like the bar, but the landlord doesn’t want to piss his tenant off. Because even though the lease expired, the bar is current on its rent. (And A bird in the cage is worth twenty flying around outside.) It’s all a game. Winning in court is more a matter of tactics and patience than of having a good legal case. The Constitution guarantees that you can’t deprive citizens of life, liberty or property without due process. It doesn’t guarantee speedy process. And due process requires that persons in possession be served with papers before a court can kick ‘em out, an issue that drags an eviction out for weeks or months. Even if the City gets an order to demolish a building that’s hazardous and irreparable, an attorney can get a stay of execution—even when a building inspector has testified that the one thing wrong with the building is EVERYTHING, that it doesn’t even have a roof! Private lawyers get paid by the hour by people with the money to hire them. Public lawyers get paid to handle all the cases brought to them, which sometimes means they don’t have a lot of time to spend on any single case. Housing court judges are elected; that means they’re politicians first. And most people have no idea what goes on in housing court—how their tax dollars are being spent—unless they’re hauled in for a violation or eviction. Something that almost never happens to most of us. Please welcome guest blogger Jeri Westerson. Jeri is a wonderful writer whose third novel in her "Medieval Noir" series has just been released. I read it and couldn't put it down. (Btw, I love that she calls her protagonist, former knight Crispin Guest, a "Medieval Sam Spade on the mean streets" of fourteenth century London). Jeri's post, while clearly of another time, will nonetheless resonate with Outfit readers today. Corruption. It covers so many events and practices. It can be found in any age, and the Middle Ages were certainly no exception. In this instance, I decided to dig up some of the more unusual cases than simple government corruption. Heck, you can see that in your daily newspaper! Enter one Richard of Pudlicott. He started out as a clerk and then became a wandering trader in wool, cheese, and butter. He went on a selling trip to Bruges but when King Edward returned to London from Flanders, poor Pudlicott was thrown in the Flemish clink for Edward’s debts and the king left him there! Pudlicott escaped and when he returned to London, he wasn’t a happy camper, vowing revenge. He began to carouse with the Keeper of the King’s Palace, and he found that the monks, being so slack and slovenly, made it easy to sneak into their chapter house— one of the few buildings unaffected by the fire—and steal their plate and coins. But carousing gets expensive, especially when you are in such rich company as the Keeper of the King’s Palace, and so Pudlicott upped the ante and decided to steal the king’s treasury with the help of the monks. When later he was caught for the theft—and a sloppy job it was—he originally confessed that he worked alone, but it didn’t take long for it to come out how many others helped him. The sacrist of the church, the abbot, forty-eight monks, and thirty-two others. The treasure was found all over town. Under Pudlicott’s bed, stashed in the graveyard, dropped in the Thames (and later fished out in fishermen’s nets), at pawnbrokers’ who simply turned the stuff in (“Oi, mate. Where’d ya get this crown?”). The majority of the monks were released fairly quickly but six servants and ten monks remained in custody. Pudlicott tried to plead benefit of clergy—that is, as a clerk, he was in the clerical class along with monks and priests and couldn’t be tried like everyone else. King Edward’s court wasn’t buying it, though, and in 1305 he was finally hanged. The Keeper and five other lay culprits were also put in the noose while the rest of the monks were more or less pardoned. So ended the great crown jewel robbery. Several hundreds of years later in a separate corruption case, but no less interesting, is this case of corruption where a man loses his knighthood. I bring this one up because my detective Crispin Guest also lost his knighthood, only for different reasons and…er…minus the horse (you’ll see in a minute). Sir Giles Mompesson and Sir Francis Mitchell were tried in 1621 before the House of Lords for the political offense of “exercising harsh monopolies over the licensing of inns and the manufacture of gold and silver thread.” Doesn’t sound horrible when put that way, but essentially, Mompesson schemed a good long time on a lot of things. He did big business in graft. He was the go-to person for licensing for inns and he was supposed to be overseeing the manufacture of gold and silver thread and imprison those manufacturing said thread without a license. If you are a member of the Order of the Garter, the banner and stall-plate (plates bearing the arms of that particular knight which are mounted in the choir stall where their family worshipped) are removed from the Chapel. Mompesson was banished but some time later he was allowed to return to get his affairs in order and then banished again, but the slippery Mompesson managed to get back into the country and stay, retiring in Wiltshire till his death. Yes, it’s true. Truth is stranger than fiction. Jeri tries to be true to her history in her Crispin Guest Medieval Noir series. 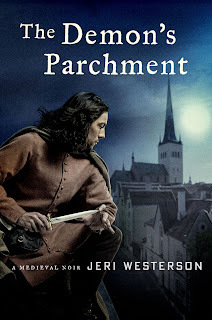 Read a chapter from her latest title THE DEMON’S PARCHMENT at www.JeriWesterson.com. I have a long-running feud with realism in novels. I never know where to draw the lines. Like many other authors, I know how to cheat when I need to. Gloss over a detail in a summary paragraph so you don’t have to reveal your ignorance. I hate doing that, actually, but sure it happens sometimes. I hate it when she says that. But she was right. And maybe that’s a good place to draw the line—to careabout reality when the reader is going to care. Will the reader care about the fact that I didn’t toll the Speedy Trial Act in my novel when the defendant pleaded insanity, when everybody knows that the Act is automatically tolled in such a case? No. Most normal, well-adjusted people probably don’t even know what the hell I just said. Somebody was talking about John Grisham the other day, and I remembered something that bothered me about his novel The Pelican Brief. You have this law student who has provided a theory on why two Supreme Court justices were just murdered; she submits her thesis in written form to the FBI; and what is the response by the evil villain, when he learns of it? He blows up her car, obviously intending that she be inside it at the time. Anyone have a problem with that? My guess is no. I did. Maybe if you killed her before she submitted the document to the FBI, sure. But once she had put that document into the hands of the federal government, what was the point of killing her? And wouldn’t her death from an obviously organized hit—a car bomb—not automatically give credibility to her theory and point suspicion directly on the very person who was trying to cover up his role in murdering the judges? I mean, really, is there anything more colossally stupid than assassinating the law student at that point? If you think it through (which presupposes you haven't stopped reading this post), I imagine most of you would agree with my logic. But my wife’s voice returns to ask me that question: “Did anyone care other than you?” I’m pretty sure the answer is no. 3. If it’s not absolutely, clearly wrong but just a subjective take on what seems realistic, let your spouse decide. Through the Life After Innocence program at Loyola University Chicago, I've had the pleasure of meeting Julie Rea Harper, a woman, who has a PhD level education and two masters degrees, was convicted of a murder of which she was entirely innocent. After serving three years in the state penitentiary, she was finally exonerated. 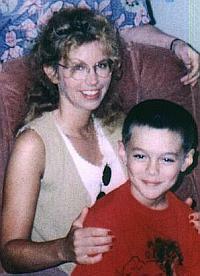 The most brutal aspect of her story is the fact that Ms. Harper was convicted of killing her 10-year-old son, Joel Kirkpatrick, described as an insightful, loving child who was wise beyond his years and loved by all who knew him. Now that Joel's real killer has been identified (Tommy Lynn Sells), one of Julie's recent efforts has been to turn her sights towards educating the world about wrongful convictions and, in particular, the women who find themselves in such immensely difficult situations. On November 6, 2010, Julie will host the first annual Women and Innocence conference, joining together female exonerees, as well as some of their male counterparts, and the people who've worked to free them, along with law students, professors, and interested members of the public. As she prepares for the conference, I contacted Julie to ask a few questions. Why did you want to start the Women and Innocence conference? There are so many aspects of women, as seen through the lens of wrongful prosecution that need to be taken into consideration. When Tabitha Pollock was incarcerated in Illinois for having not realized her child would be killed by her then boyfriend, she was held accountable for what she didn't know. (It was presumed that as a mother, she should have). This is but one example of a double standard. It is a result of the conceptual map or schematic that society holds for the idea of what a man or woman is and can acceptably be. A man can become violent - even though it is wrong for him to kill, technically - and we can accept that a man provoked may act out aggressively. But women generally do not act aggressively and violently. So when a woman is charged with a violent crime it is already an anathema for the jury that she faces - she is presented as a person who has already stepped beyond the conceptual framework of what is acceptable societal behavior for a woman to exhibit - no matter the explanation. There are many more issues surrounding women and innocence, and there is a need for a forum about them. Do women face the same issues as male exonerees? Women face some of the same, of course, but some different ones as well. When a man exits prison, he may have physical scars - which are character building and such war stories are interesting to society and make him potentially more intriguing. Women on the other hand exiting with scars are less attractive and hence less desirable to society. Fact is fact. We do not wish to hear about a woman’s story of either how she was exploited or how she exploited another. But when a man becomes king of the jungle - well, that society finds him more readily appealing. An example though of how both stories are finding a venue in popular media currently is the movie Conviction with Hillary Swank playing Beverly Waters. While this is about a man who was wrongly convicted there is a significant role of the woman who works toward his innocence. Again - the woman stays within the more approved societal role as the 'caretaker' and 'angel of mercy'. These things will change with time as society is opening the territory for wider definitions, but for now there is clearly a boundary line that has more traditional roles in place and these are still greatly affecting those of us who have lived the real experiences of the wrongly convicted. Is there one person you credit for your exoneration? Will they be at the conference? No - there were gobs and gobs. And while I would love for them all to be there, they are busy helping others and the needs of a larger audience. However some will be in attendance, and that's super cool. My parents will be there, as well as attorneys Karen Daniel and Judy Royal, from Northwestern's Center on Wrongful Convictions, and I believe Stephanie Horton. And author, Diane Fanning, who coincidentally played a role, as fate sometimes draws characters into our life story. Private investigator Bill Clutter, who worked on my case, may come to share about Jeannette Slover's case, which I am hopeful one day she will also be free. She is a woman I met inside who is definitively innocent and needs to be exonerated yesterday. One thing that happens when you go thru something like this is that you find out just how many people you need to thank for their role in your life - the good parts of it - and you also find out how great the needs are that still exist in the world right around you. This is a very obvious fact in my daily existence now. The question I hear often about exonerees is how they cope, day to day, with what they went through. Your situation was even more intense than most. Can you share with us one or two things that help you? I thank God constantly for everything I put into my mouth, for every deep breath I take, and the provisions he makes for me. And I ask his help with every need I have. And I still do a lot of whistling in the dark. I also accept the fact that I won't just get over what I've been through over night. It didn't happen overnight and, it isn't going to go away that quickly either. However, the healing comes in unexpected ways and is evident as I look back and through the loving grace of others in my life. I am just very very thankful for each and every day. Tell us about Joel and what you like him to be remembered for. He was a person who loved his people. He had no qualms about saying something was wrong when it was, and he didn't get confused about what mattered most. I used to tell him when I grew up I wanted to be just like him. He used to say when he grew up he wanted to test computer games for a living. Because he had a genius IQ, I kind of hoped he would reach a bit higher for his eventual profession by the time he reached adulthood, and yet I couldn't help but be a bit amazed that he was able to never make others feel stupid when they were around him, and that he saw the beauty in others and the most simple moments. We would sometimes sit and read snuggled up in quilts with a favorite book and a cup of soup while the rain came down in the summer because we both loved the steady, refreshing sounds of the rain and the peace it offered as a backdrop. I want him to be remembered as someone who knew what mattered and did what was true and right, someone who would never have done what the state did. But someone who would forgive them - and yet ask them to change what they've done and not do it to another person - but do it better next time. Where can people go for more information about Women and Innocence? I’m frequently asked whether I outline my books before I write them. Not really, I always say. But maybe I should say yes. A little background: I’m a child of Catholic education from Grade 1 through Notre Dame. I was diagramming sentences before reaching puberty. The nuns, priests, and Mr. John Kessel also drilled us on outlining. It involved Roman numerals and capital letters and lower case Roman numerals and lower case letters and lots of indentation. I loved outlining. I scratched outlines on legal pads that nearly ran longer than what they were written for. I outlined every essay, newspaper story, and magazine feature I wrote in college. It helped me put things in order. I understood the beginning, middle, and end before I committed a word to actual article or essay. For me, outlining became the thinking part of writing. Writing actually seemed easier (note: I did not say easy) after outlining. The need to meet daily newspaper deadlines weaned me off of outlining to some degree. For longer narrative features, I took to assembling detailed chronologies that, while dispensing with the numerals and letters, did the virtual work of an outline by giving rough shape to the notes I’d amassed from interviews, documents, observations and other sources. I tried to outline the early chapters of my first novel, Starvation Lake. It didn’t work. The problem wasn’t that I couldn’t put things in order; the problem was that I didn’t have much to put in order. I knew the beginning and I had a vague idea about an ending but I had no idea what would happen in between. And I found it nearly impossible to imagine what would happen without actually writing it down in narrative form. So I ditched any outlining—or “plotting,” if that’s what you prefer to call it--and just kept tapping away on my laptop. The characters behaved. The setting revealed itself. The story unfolded. I wound up with a manuscript that I then turned inside out with hundreds of edits. Was that rough manuscript a de facto outline? In an interesting how-I-write piece in my newspaper on Saturday, Philip Roth said he doesn’t map out his books in advance, but rather “feels (his) way going forward. The book educates me as I write.” As with everything Mr. Roth writes, I couldn’t put it any better. (Here’s a link to the piece: http://tinyurl.com/32xtb5v). In addition to whatever manuscript I'm writing, I keep a separate Word file to which I frequently toggle called, “stuff.” It’s essentially a list of all the balls I’ve tossed into the air as I’ve written the manuscript and a reminder that I need to bring them down at some point, preferably not on my head. Is my stuff file also an outline? Do I actually have two outlines? For the record, I did not outline this blog before I wrote it. Does it show? Do you outline? If yes, how? If not, why not? I don't know how you all feel about evolution. I like it as well as anyone else does; I just don't think it's gone far enough yet. One of the best books on the subject is THE FEATHERED ONION, subtitled Creation of Life in the Universe, by Clive Trotman [John Wiley & Sons, 2004]. Ever since Archbishop James Ussher calculated that Creation happened on October 22nd [or 23rd] 4004 B.C., the probable time of the creation of the earth has been pushed back, and back, and back. THE FEATHERED ONION is particularly good at describing the process leading to the changes of dates and the current evidence for the age of the universe--possibly 13 billion years. Trotman is also wonderful on the [to me at least] surprising complexity of unicellular life. There is a good deal of math in Trotman's book, but it's well explained and the writing is clear and lively. This is a book that is truly mind-expanding. And the other stories I mentioned above? So, for Banned Book Week, buy a banned book. For my granddaughter, I think I'll buy TO KILL A MOCKINGBIRD and THE COLOR PURPLE. She has already read all the TWILIGHT series, which does not seem to have damaged her, and anyway I don't think Stephanie Meyer really needs my help. For my grandson, TOM SAWYER and HUCKLEBERRY FINN. They didn't make the list this year, but they often have in the past. Besides the Mark Twains, others often challenged are 1984 and ANIMAL FARM by George Orwell, A LIGHT IN THE ATTIC by Shel Silverstein, SLAUGHTERHOUSE-FIVE by Kurt Vonnegut, A WRINKLE IN TIME by Madeleine L'Engle, BRAVE NEW WORLD by Aldous Huxley, and such all-time faves as CANDIDE by Voltaire and JUSTINE by the Marquis de Sade. Because I have a few friends with new children or grandchildren, I will also buy JAMES AND THE GIANT PEACH by Madeline Holler, one also not on this year's list, but frequently challenged. There are a few iffy words in it, and some unfortunate characterizations of people by their body builds, but most children don't notice or care, and if they do, it's an opportunity for discussion. Buy a banned book. They make great birthday presents. Starting today, Jen Devourer of Books will be featuring Chicago authors all month on her blog. If you haven't read it, you should. She's sure to cover someone you'll want to read. And who knows? You might even see some familiar names and books pop up. She's partnering with another blogger as well, but she'll tell you all about it.